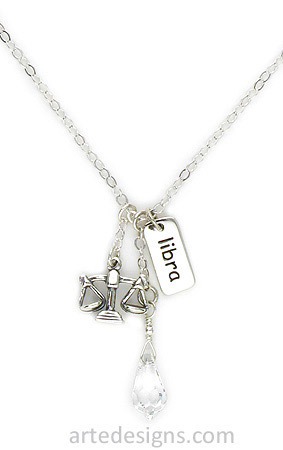 People born under the sign of Libra are known to be diplomatic, peaceful, and harmonious. Show off your horoscope sign with these unique sterling silver zodiac charms and Swarovski crystal. Charms hang approximately 1.5 inches long on a sterling silver chain. Choose a 16, 18, or 20 inch sterling silver chain with a lobster clasp. Copyright © 2009 Arte Designs Zodiac Necklaces.